Modern timber frame construction is an art that closely resembles historical timber frame construction, although modern technology can provide more precision in timber joinery and construction. Regardless, there are no nails holding the frame together. Only pegs! Years ago, timber frame joints were cut and fit by hand, at the construction site. This led to strong, but crude timber joinery. A few traditionalists still build frames this way today. However, most modern timberframe builders rely on precision, computer controlled machine cut timber frame joints. Even so, sometimes a little adjustment must be made on-site when the timber frame is being raised. Modern timber frame construction begins with beams that have precision pre-cut joints. 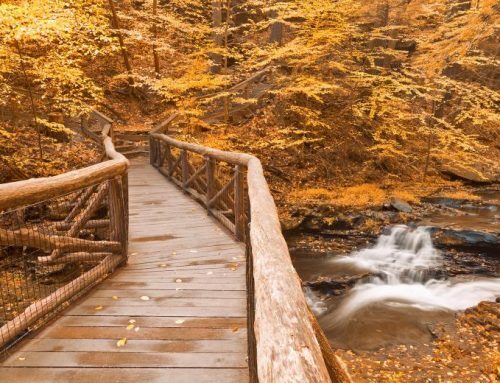 Building the Timber Frame House by Tedd Benson and James Gruber is one of the best resources on the market for people who want to build a timber frame home. 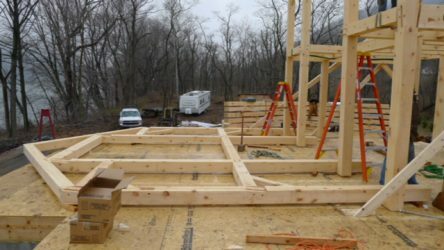 There are a number of steps that go into building a timber frame house, or, as it is also known, a timber frame raising. This is the construction of the “skeleton” of your house. Plan and design – While it is true that you can have almost any floor plan in a timber frame house, there is still a lot that goes into the plan and design. 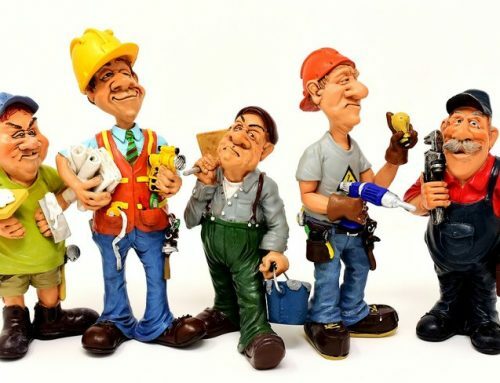 And making changes in the floor plans can affect other areas of the house, including the foundation or basement configuration and the roof design. Because everything is so integrated, it’s important to have an architect working with you. And, for a timber frame home design, you need to have an engineer make sure that the finished structure will be strong—and safe! Planning for your timber frame home is more complicated than sketching out your floor plan on a napkin. Beams and joinery – When your plans have been completed and checked for safety, they will get an engineer’s stamp. A materials list will be completed, so that the builder will know what materials will be used in construction of the shell. At this point, preparation of the beams begins. Beams are cut to length, and, for most modern timber frames, the joints are also cut and shaped. Delivery – On a pre-arranged date, your timber frame beams will arrive at the home site, by tractor trailer. Your builder will require that you have a space large enough for the truck to deliver the beams—and then to exit the work site. This is so important that it can even affect the amount of space that you will need to clear around the house. Timber frame construction starts on the ground, in sections like these. 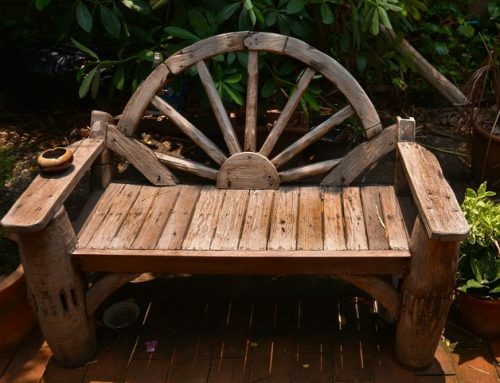 Timberframe sections – A specialty crew of timber frame builders will come to your home site and construct the sections of your home. These sections are laid on the ground and will be lifted into place, usually the next day, by a large crane. 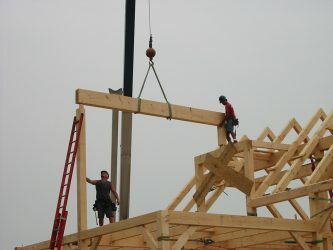 Timber frame house sections being lifted into place, during timber frame construction. Lifting timber frame sections into place – Each timber frame section is lifted into place by a large crane, using heavy straps. 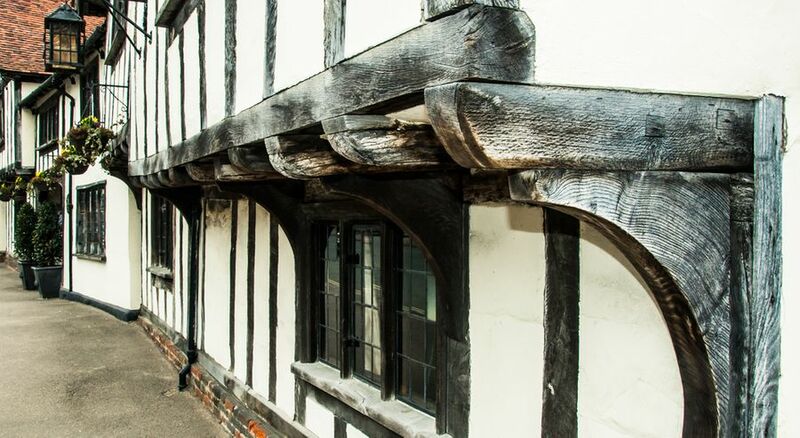 The timber frame builders do not lift the heavy beams, but they do guide them into place—and then they complete the joints, by guiding (sometimes with a little pounding) the beams together and then inserting pegs into the pre-drilled holes. Temporary braces hold timber sections in place during timber frame construction. 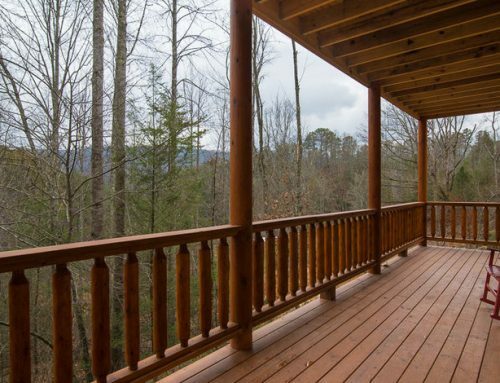 Temporary bracing – If you have ever seen a porch roof or a balcony replaced, you probably noticed the boards that were used to support the project while it was being completed. The same kind of temporary bracing is used to hold certain timber frame sections in place, until the joints are fastened securely. Joints being finished in a timber frame construction project. Joints are fastened – Mortise and tenon joints are put into place, and pegs are inserted to “lock” the joint. 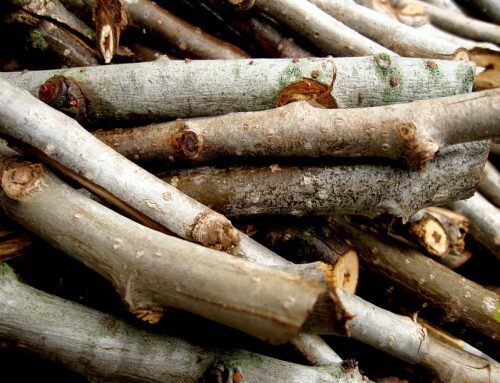 Pegs can then be trimmed or left sticking out–a matter of personal preference. 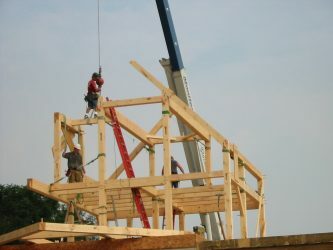 Stand-alone frame – When the frame is completed, the temporary bracing boards are removed, and the timber frame for the new home is completely secure—standing alone, with no other support. 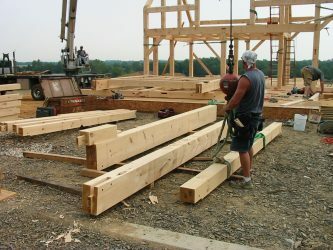 Timber frame construction is an art, and there are only a few companies and people who know how to construct this specialized type of post and beam home. 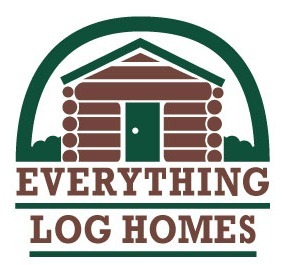 If you are fortunate and have a timber frame home, you will have a lovely, eco-friendly home that will last for generations. 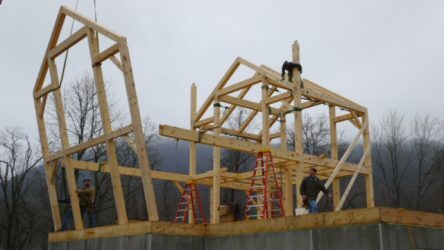 An excellent resource for building a timber frame home is Building the Timber Frame House by Ted Beason and James Gruber.